The lower jaw is a horseshoe-shaped bone that is suspended in space by two joints, which articulate with balls into their corresponding sockets in the rigid skull. The physiological position of the jaw is determined by an intricate mechanism involving muscles, tendons and ligaments. The end-position of the jaw is determined by pairs of opposing teeth contacting each other and stabilizing the lower jaw against the upper jaw. I call these teeth “columns”. As we age, or in some cases following certain aggravating conditions, the vertical relationship between the jaws is diminished, and an “overclosed bite” results. The “columns” are shortened and worn down. As an analogy, the “roof” of the mouth is lowered. In the space inside the mouth, or the “room” that is now smaller, the tongue has less room to fit and function, and the airway, our life channel, is diminished in size and volume. “Bite opening”, a simple layman’s term to describe the orthopaedic gain in vertical space between the upper and lower jaws, is a method to restore the vertical relationship between upper and lower jaws to the original, or to a dimension that the body physiologically was meant to have, or once had. What are oral and dental signs of an overclosed bite? worn-down teeth, many times so extreme that the teeth are flattened and have no enamel covering. There may also be other signs such as small craters caused by erosion on the chewing surfaces of the back teeth. Fracturing of fillings, ceramics, or outright teeth, especially if they are root canalled. thinner lips, as these get pushed together and collapse inwards, (just like in the elderly) when the vertical is reduced. Can a history of orthodontics (braces) cause an overclosed bite? According to our experience within our patient pool, most of those who have had braces with 4 sound premolars extracted also have over-closed bites, which is not only erosion-caused, but also due to an abnormal constriction of the size of the jaw and the inward tilting of the teeth. Many dentists and orthodontists who have a deeper understanding of the way the jaws and jaw-joints works, frequently open the vertical in order to avoid relapse, or to prevent fracturing of tooth restorations. What are other TMJ symptoms of loss in vertical? The vertical collapse ultimately reflects in the jaw-joint. As the teeth wear down, the joints gets pushed back and jammed into their socket in the skull, and the delicate tissue behind the joint space, as well as the disc between the cartilage faces are damaged. Clicking, jaw tension and headaches ensue, which are common signs of Jaw-joint dysfunction (TMD). How does one identify a loss in vertical at first glance? If the lower incisors are worn down and crowded, facets appear and the dentin shows through, that indicates that at least 2 mm of vertical has been lost. How is vertical bite opening achieved? PHASE I: One option is to add some temporary material (composite) to lower teeth at a pre-determined opening, as dictated by the jaw-joint and neuromuscular function. Another option, especially in patients who have TMJ symptoms, is to have them wear a splint on the teeth to train the jaw to function in the new position for a few months. This allows for healing of the jaw joint. Phase I is an interim phase that is fully reversible and lasts 3 months. PHASE II: If the new jaw position is drastically different and the teeth are crowded or angled incorrectly, braces are placed to have the teeth move to a new position in space as dictated by the jaw. 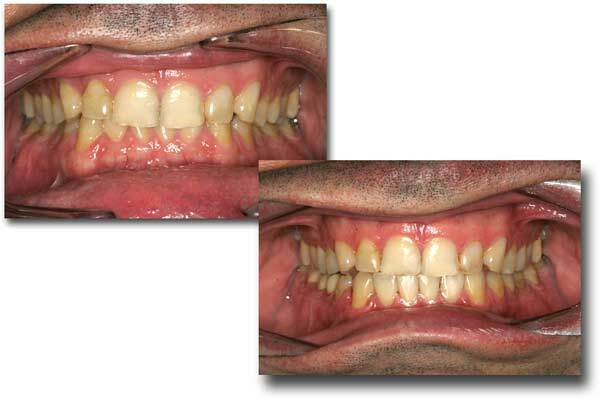 If many teeth have failing fillings or crowns, or are worn down, they are restored with porcelain crowns, overlays or onlays to the new dimension dictated by the jaw. What are other benefits of restoring the vertical? This entry was posted in Anatomy, Bite Opening, Education by Admin. Bookmark the permalink. Hi is this available in NSW Australia? I lthink that both I and my young son would benefit from bite opening procedure. Thank you for your informative overview.